Official websites of 7 major Syrian city hacked by Anonymous hackers as part of hacktivists Anonymous' Operation Syria ( #OpSyria ). Anonymous has replaced the home pages of official Syrian websites with an interactive map of Syria, showing the names, ages and date of deaths of victims of the Syrian regime since the protests started in March. 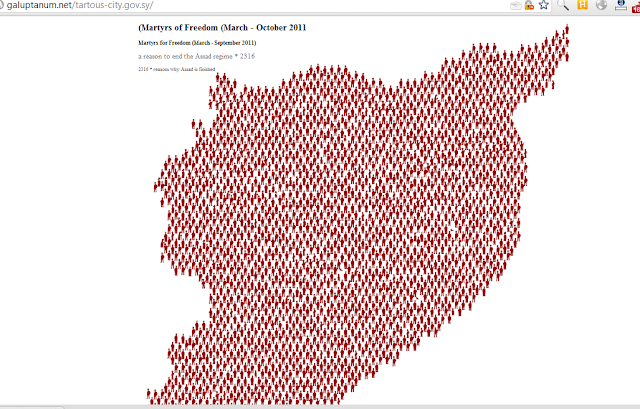 They call it Martyrs of Freedom (March - October 2011). The figure 2,316 commemorates the number of Syrians killed by the Syrian regime since anti-Assad protests started in Syria in March. The victims' names, ages and dates of death appear as you hover over the map of Syria.